Well I’m sure you all are getting as sick of the repeated speculations as to what really happened with Skype. So am I. In many ways, it is unfortunate that so much has been written about the Skype outage, to the point that now that people are looking at it from a broader perspective, such as why did their communication fail, or how companies need to review their backup plans for situations such as these, either no one wants to read about it or it gets buried in the overwhelming amount of Skype related posts. But the bigger picture is not about what happened to Skype as much as it is about how Skype tried outdated, 1.0 communcation techniques that failed miserably in the current 2.0 environment. Even in their ‘clarification’ post today on the situation, seems to sort of recognize they have a communications problem, but clearly doesn’t recognize why. And forget this is about Skype. Think of it as about any company, in a situation that affects their users and how they communicate and handle the situation. I wish I had written this post, but it says everything I would want to and so rather than repeat it, just go read P.R. 2.0’s post called “Crisis Communication 2.0 – The Skype is Falling“. Or if you prefer, here is the post on a white background (I don’t care as much for black background with white lettering if I’m trying to read something). Library 2.0 – ACPL’s New Books Wall Mashup and More! 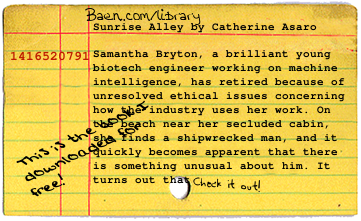 Just for fun, I created an old-fashioned card catalog card for the book I had downloaded from baen.com/library using John Blyberg’s card catalog generator. You have to enter the data by hand (I copied it from Amazon.com) but it makes a really fun graphic. With some programming, you can make a mashup that uses this. A mashup is a website or application that combines content from more than one source into an integrated experience. Sean Robinson (my husband and head of IT Technology at the ACPL) created this book wall called Books we added to the catalog yesterday combining the new material checked in each day at the ACPL (Allen County Public Library) with data from Amazon. It shows pictures of the actual book covers for each book and if you click on a book cover, it will show you an old-fashioned card catalog for that book and information on it from Amazon (if the book is brand new, it doesn’t necessarily have review info yet). Then you can click on “Look this up in our catalog” to see the ACPL card catalog information on that book like how many copies there are and if they are available and where they are located and do all sorts of neat things like add it to your list or put it on hold. You can also find more books by that author, more books with those topics or browse nearby call numbers (books that would be on the library shelf with this book). Go check it out and play around with it. It is a great example of how you can combine Web 2.0 tools to create something new and exciting and useful. For this and more innovative ways the Allen County Public Library uses Web 2.0, visit their Library 2.0 site: ACPLib2.0. ACPL Rules!